Involves the concept of the three "elements" needed to sustain a fire. These are Oxygen (but sometimes referred to as air), Heat, and a Fuel Source. In most all environments there is adequate oxygen under normal circumstances for a fire to occur. Once the fire starts it will continue as long as oxygen remains present and nothing is done to drastically decrease heat. But, a fire cannot continue to burn if there is nothing to burn. That is if no fuel source is present. Let’s take for example burning paper, obviously if a small piece of paper is burning and is not in contact with other flammable objects, the fire will probably go out once the entire piece of paper is burned. In this example the fuel source is very little and when it is burned off, the fire is extinguished. But, if a large garbage can full of paper is on fire, it will burn a lot longer and produce more heat. Again, in isolation the fire will be extinguished when all the paper Is burned; the fuel source is cut off. Note that the amount of fuel, in this case paper results in a larger flame and more heat. The larger flame also consumes or requires more oxygen. 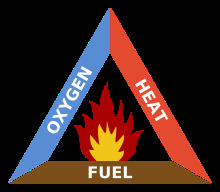 Now let’s take another fuel source to show that the difference in the type of fuel source can be a determining fact in how the fire triangle is used. If the fuel is gasoline, there is not only an explosive characteristic to the fuel source but also a potential for more heat to be produced. This type of fire might require a much greater reduction in heat than a paper fire to extinguish a fire if heat reduction is the method used. I might be possible to cut the fuel source off. This is the reason most states require an automatic and/or manual fuel cut off button at gas stations. A fire such as a gasoline fire adds another potential threat and that is since it is a liquid and explosive fuel source, the fire can easily spread to other areas outside the original area of the flame. A paper fire might also spread even in isolation if burning particles are carried to other areas by air or wind for example. Either of these fires can possibly be extinguished by cutting off or drastically reducing the heat or cutting off oxygen, or by cutting off the fuel source. Some fires are better extinguished using a specific method. 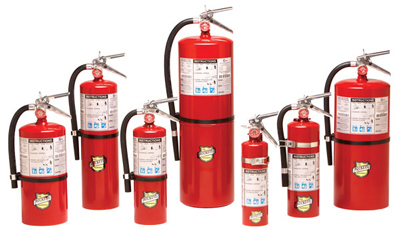 For this reason different types of fire extinguishers are designed for different fuel sources. See Fire Extinguisher Types. An ABC type fire extinguisher is used for paper fires. The powder in the extinguisher reacts with the flame to blanket a fire and cut off oxygen. This is just one example and one type of fire extinguishers. Many other factors play into which fire extinguisher or fire suppression system to be used. All fires have a potential to reignite as long as there is fuel present. So, in my opinion in regards to electrical fires, the fire triangle needs another component to be better understood. That is because electrical fires may be extinguished and still be hazardous and like all fires they have a potential of reigniting. A downed power line for example would still be in danger of causing a fire even if extinguished if a current of electricity still flowed through the line. Most people do not speak of electricity in terms of “fuel”. So, stating that the fuel needs to be shut is inadequate for the average person. Obviously the electrical current would need to be turned off. Therefore, for the time being when using and explaining the Fire Triangle we must keep this in mind.